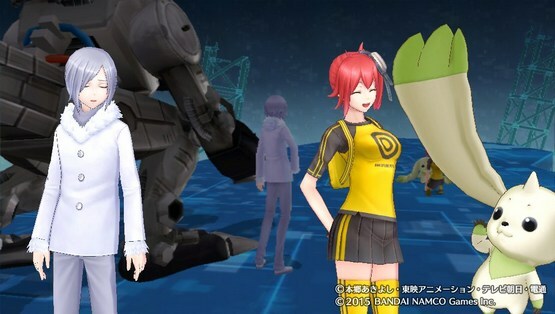 At Anime Expo 2015, Bandai Namco confirmed that Digimon Story Cyber Sleuth is releasing in 2016 in North America for the PlayStation 4 (retail and digital) and PlayStation Vita (digital). As for Europe, it’ll be digital-only on both PS4 and PS Vita in 2016. Set in the near future, the line between the real and digital worlds is blurred. Logging into cyberspace is part of everyday life. For one teenager, a harmless on-line chat spawns a chance encounter with a mysterious hacker. Little did this teen know, this brief meeting would lead to a digi-monumental adventure. In Digimon Story Cyber Sleuth, scan, raise, and train your faithful Digimon companions to battle by your side against a group of hackers. Do you have what it takes to crack this digi-case? You can read our review of the Japanese PS Vita version over here, with some Japanese screenshots in the gallery below.